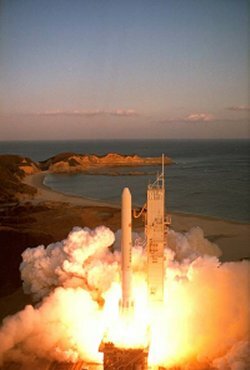 The N-series of Japanese rockets are versions of the Delta rocket built under license in Japan using American and Japanese components and used to launch NASDA (National Space Development Agency) satellites. The N-1 (not to be confused with the giant Soviet N-1) launched seven satellites in 1975-82 and could place up to 130 kilograms in geostationary orbit (GSO). The larger N-2 launched eight satellites in 1980-86 and had a GSO payload capacity of 350 kilograms. The "N" prefix is taken from the first letter of "Nippon" (Japan).